Our egg shaped bunny is attached to a large hanging egg—the Bunny Egg-spress. Both sides of our hanging bunny are finished—one one side is a boy bunny and on the other side a little girl bunny. If only one side of the bunny is finished, a group of them would make a cute bulletin board, “On our way to Easter on the Bunny Egg-spress.” The boys could make the bunnies with the cap, and the girls could do a bunny with a bow. This project, “Bunny Egg-spress,” is found in the 2nd Grade Projects Gallery in the sidebar. 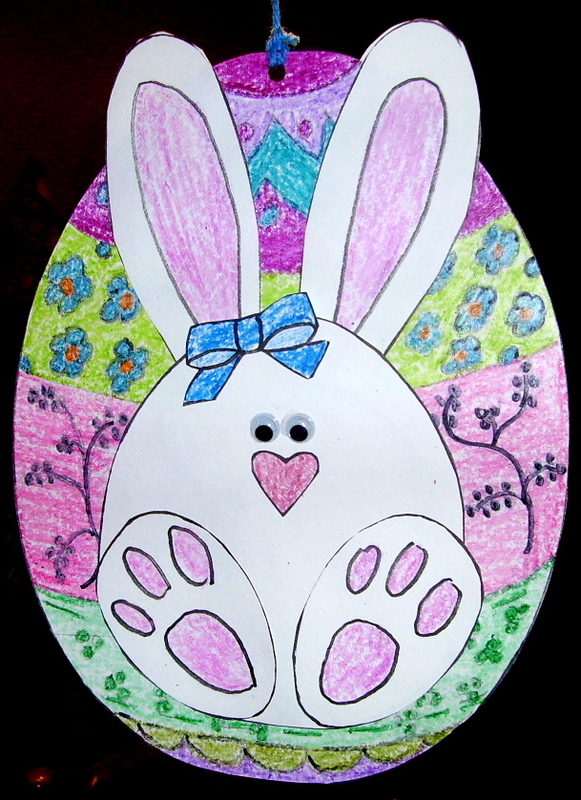 This entry was posted in 2nd Grade, Easter and tagged 2nd Grade, bunny egg-spress, easter crafts for kids, easter projects for kids, easy egg craft, egg shaped bunny, hanging bunny, hanging easter egg with bunny, paper craft. Bookmark the permalink.